It was a calm Tuesday morning in Bagamoyo, a small town situated along the Indian Ocean coast in Tanzania. Gentle winds blew onshore as fishermen and women returned home with their catch after a long night spent in their traditional African outrigger canoes called ngalawas. This typical day for so many citizens of Kerege was anything but typical for some of the more than 400 people living with HIV who inhabit the village. For them, it was one of two days each week that they could receive dedicated and expert treatment, care, and support right in their own community at the Kerege Health Center. Enrolled nurse Clotilda Onesmo – along with two other nurses and one clinician – stood ready to serve the men, women, and children who came to the heath center for life-saving care that day. Clotilda recalls one client she had started on antiretroviral therapy (ART) six months earlier, who had received alarming results from her first viral load test. “Her viral load was so much higher than expected for a patient taking her meds properly,” Clotilda explained. Tanzania’s National Guidelines for the Management of HIV and AIDS state that all adults and adolescents with a viral load measurement greater than 1000 copies/ml should be managed as possible treatment failure and provided with enhanced adherence counseling before having a repeat viral load test after three months. “I was very concerned and gave her enhanced adherence counseling, but three months later another viral load test showed no improvement. I therefore knew it was the treatment regimen that was failing my client, so I started her on second-line ART,” Clotilda said. “I am happy that the client is now virally suppressed,” she reported with a smile. “When I started initiating ART for patients in 2010, I learned by observing a doctor I worked with. Really, I knew very little about how to manage these clients,” Clotilda admitted. Thanks to the training and mentorship she received over the years from that doctor, and from other clinicians she’s worked with, Clotilda says she feels much more capable and experienced now. In February 2018, Tanzania’s Ministry of Health, Community Development, Gender, Elderly and Children (MOH) approved the Nurse Initiated and Managed ART (NIMART) Handbook, a policy document that guarantees nurses receive the continuous professional development they need to effectively start patients on ART, manage these patients, and provide appropriate referrals to physicians, as well as linkages to other services they might require. This means that practicing nurses such as Clotilda will soon be empowered by formal and ongoing training and supportive supervision – an important step forward in the country’s efforts to ensure people living with HIV everywhere have access to quality care and treatment. “When more nurses receive training and supportive supervision on NIMART, it will shorten the patient journey significantly,” Clotilda said, explaining that the country’s severe shortage of clinicians translates to long wait times for clients who’ve been diagnosed with HIV and need to start treatment. Nurse Clotilda Onesmo provides post-test counseling on HIV to a client at Kerege Health Center. Courtesy AIHA. 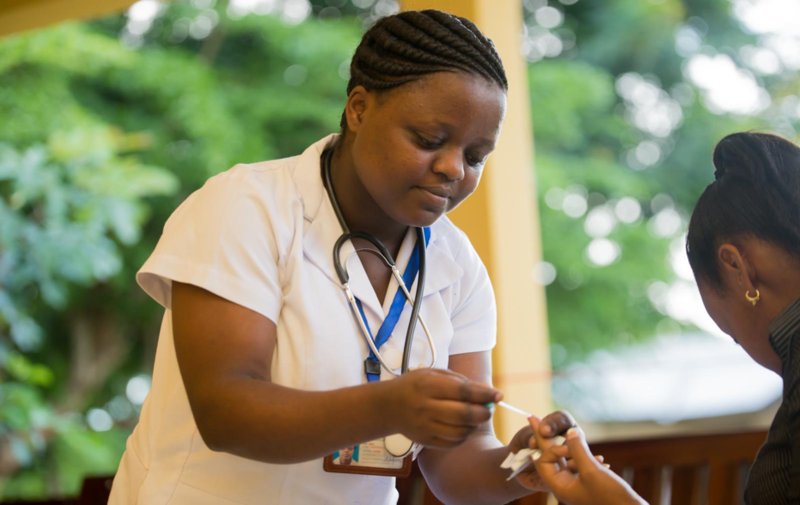 As frontline health workers, nurses who can take on the task of initiating and managing ART – particularly in rural or underserved communities – are critical to Tanzania’s efforts to achieve the global 90-90-90 targets by providing quality, comprehensive health services, including ART, to people living with HIV. 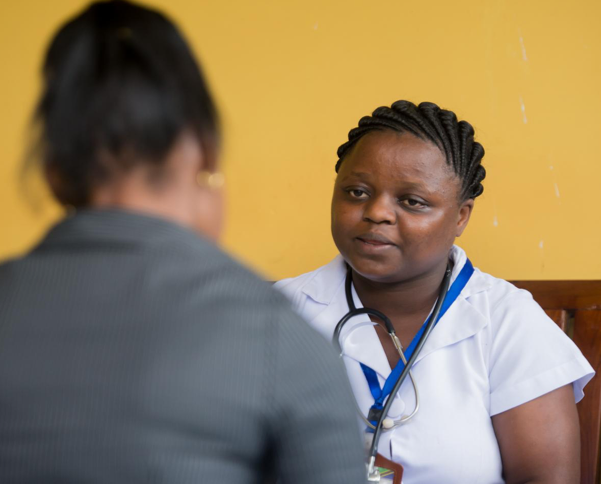 According to Clotilda, nurses have the potential to increase identification of people living with HIV and ART uptake through provider-initiated testing and counseling when they screen clients for different conditions or infections, such as TB. When people are receiving other services, nurses can build the kind of rapport that is necessary to broach the subject of HIV, which is still a disease fraught with stigma and many misconceptions. Nurses can suggest the client get tested and provide crucial information about HIV, including potential treatment, side effects, and adverse reactions. Clotilda is quick to point out that she takes her patients’ outcomes very seriously and considers lack of ART adherence one of the biggest challenges when providing HIV services. “We can mitigate this through better counseling and support for people living with HIV throughout the continuum of care,” she said. In close coordination with Tanzania’s MOH, the Office of the President, regional administrations, and local governments, AIHA is working to implement NIMART across 12 high HIV burden districts spanning the country in 2018, with plans to scale-up in other high burden districts next year. These interventions complement national efforts to attain epidemic control by 2020 and put nurses squarely at the center of efforts to achieve the 90-90-90 targets. AIHA’s national-level work to strengthen Tanzania’s nursing, social work and community-based health worker cadres — all critical to Tanzania’s task sharing strategy — is supported by the U.S. President’s Emergency Plan for AIDS Relief (PEPFAR) through the U.S. Centers for Disease Control and Prevention (CDC) in Tanzania. The project is implemented through AIHA’s HIV/AIDS Twinning Center Program, which is funded through a cooperative agreement with the U.S. Health Resources and Services Administration (HRSA).